In this episode, I sat down and spoke with my good friend, Justin Plavic. Justin is a middle school social studies teacher. He is also a martial arts instructor that hold a 3rd degree black belt in Japanese Jujutsu, a 1st degree black belt in Aiki Jujutsu, and is a practitioner of Kung Fu for over 10 years. As a teacher he strives to challenge the minds of our worlds future. He started martial arts in middle school after being repeatedly bullied by peers. Martial arts gave him the confidence and inner strength to stand up for what is right. That stuck with him his whole life and now he molds minds of students of all ages. The audio is a bit glitchy at times, as the computer that was recording this was apparently not able to keep up with what I was throwing at it. While a few areas are a bit rough, you can make out the gist of those spots, and most of the conversation was recorded without issue. Justin and my schedule are always full of things that whenever we make a point to hangout with each other, one of us has something already scheduled. The fact that this episode even happened – especially with Justin living in Arizona and me in Ohio – is a feat in and of itself. 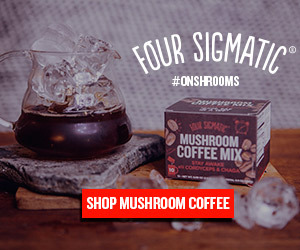 Optimize your life with the power of mushrooms. Enter BORDEAUX for 10% off your order!